This past weekend, I set up at the Punk Rock Flea Market in Philadelphia to unload some of my vintage toy collection. Of course, part of the fun of being a dealer is being able to look around and buy from other dealers throughout the day, and I came home with a big pile of fun stuff. My pick of the week did not come from that flea market. The flea market was a two-day show, and though I had the option of setting up both days, I decided against it, mostly because I’m really exhausted after just one day. Even though I was trying to take it easy the day after the show, I decided to hit a thrift store when I went out for lunch, and boy, am I glad that I did. 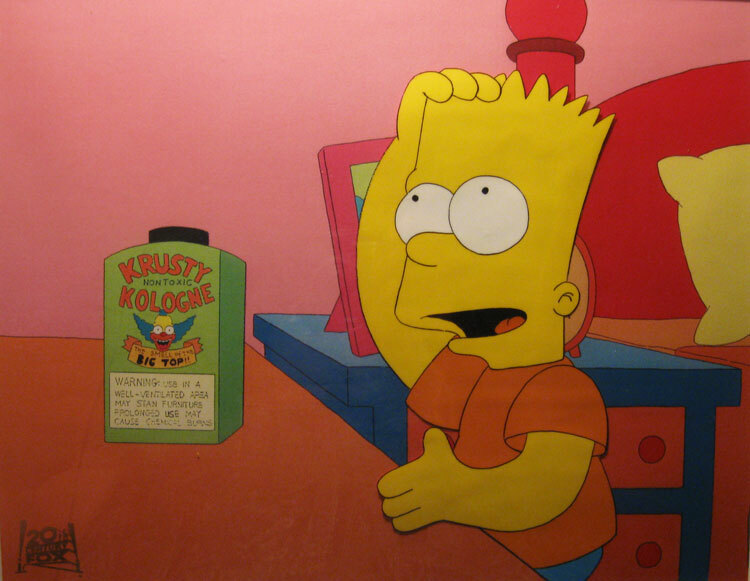 Bart prepares for a visit from his icon with Krusty (non-toxic) Kologne! This is an animation cel featuring Bart Simpson. Specifically, it’s a cel from the classic Season 3 episode, “Like Father, Like Clown,” where Krusty the Clown is reunited with his estranged father, Rabbi Hyman Krustofski. In this very specific moment, Bart is using Krusty (non-toxic) Kologne in preparation of the dinner Krusty the Clown owed him for proving his innocence in an earlier episode. The cel is hand-painted, but the background is laser-printed. However, the cel does have an official 20th Century Fox stamp, so while the background isn’t original, it was laser printed specifically to match this cel. Despite the fact that The Simpsons still looks the same today in 2013, traditional cel animation was replaced by digital ink and paint animation beginning with Season 14, which began in the fall of 2002. In other words, this form of animation has not been used in over a decade on The Simpsons, so you can’t buy this sort of thing for any episodes newer than 2002. I’ve written about The Simpsons before, so it should come as no shock that I was ecstatic to find this in a local thrift store. Now, it wasn’t as though they were giving it away, but it was priced at a mere $25 and labeled “as is” because some of the white paint along the border of the frame was missing. I can replace the frame. I couldn’t replace this cel, but thankfully, it’s fine, and examples from seasons this early appear to be quite valuable and desirable if completed listings on eBay are to be believed. This just goes to show that even when you go to a place where you know you’ll find amazing things, you really do have to keep your eyes constantly open and be prepared that something amazing could show up literally anywhere and when you’re least expecting it! This entry was posted in 1990's, Ben, Comic Characters, Humor, Uncategorized. Bookmark the permalink.